The Scout Section is for all young people aged between 10½ and 14, no matter what your gender, faith, or whether you have any disabilities. A young person can come in to the Troop at 10 and may stay until they are 15 years old. The Scout Troop is the third and final Section in the Scout Group, after which Scouts are encouraged to join the Explorer Scout Section which is run on a District, rather than Group, level. Our Scout pack meets on a Friday evening from 8:00 to 9:30 pm. Scouts is largely based upon outdoor activities- “Everyday adventure”. Our scouts have many camps each year, and learn survival skills. At present they are trying out camping in hammocks- no tents! They have a number of Challenge Awards and Activity Badges. 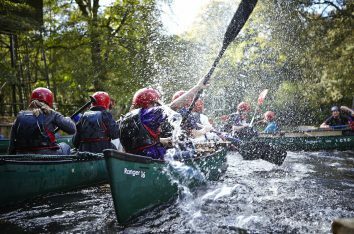 Being outdoors is important and taking part in both the traditional Scouting skills, such as camping, survival and cooking as well as the wide range of adventurous activities from abseiling to yachting, form an important part of the activities. 99th Reading takes part in local competitions- camping, backpacking, survival and others. For more information on the Scout section, please click here.